Concentrations of radioactive radium-228 in the Arctic Ocean increased between 2007 and 2015. The radiation involved is far too low to be threatening in itself, but could act as a marker of deeply worrying trends. The good news is future measurements of radium could help quantify some of the most worrying aspects of climate change. Social media carries regular reports, often wildly exaggerated, as to how the Fukushima nuclear reactors are adding to radioactivity in the Pacific Ocean, but what is happening in the polar regions may ultimately be much more important. As Lauren Kipp of Woods Hole Oceanographic Institution notes in Science Advances, climate change affects the Arctic region particularly strongly through the “Permafrost thawing on land and on continental shelves, increased river discharge, and reduced ice cover.” The last of these has been extensively tracked, but it is harder to measure the first two. Marine measurements of materials deposited in the ocean from permafrost melt and river discharge could change that. 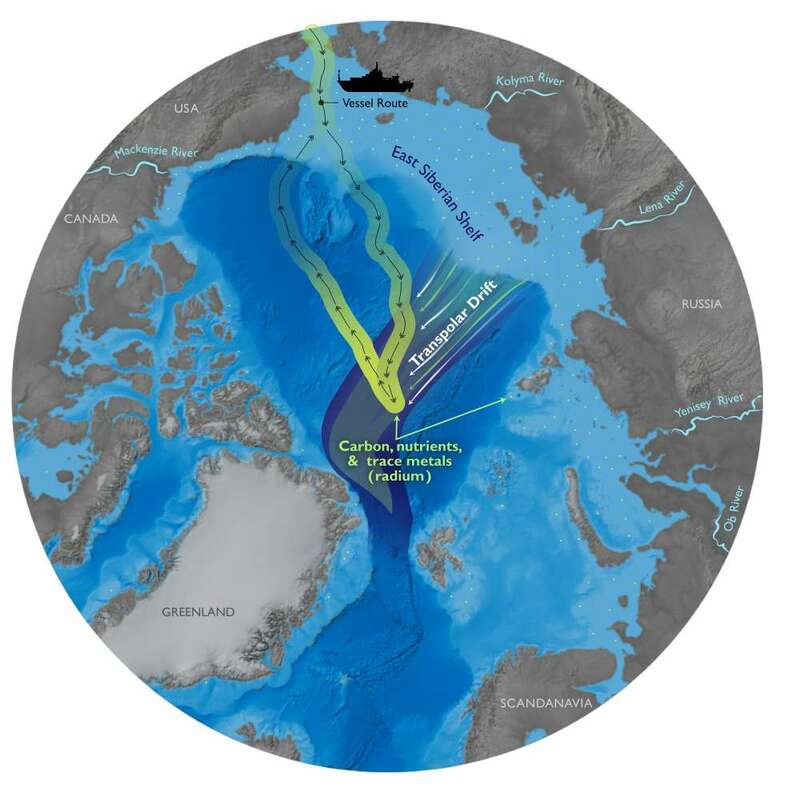 Sediments on the continental shelves that make up half the Arctic Ocean's territory contain thorium isotopes, which radioactively decay to radium. “Unlike thorium, radium is relatively soluble in seawater,” the paper notes, so measuring radium concentrations makes it possible to explore the interchange between the sediments and the waters above. In particular, it can provide a measure of the rate at which permafrost melting is releasing soluble materials into the ocean, a process enhanced as higher winds transport more water from coastal waters to the central Arctic. Unfortunately, systematic records of radium concentrations in the Arctic prior to 2015 don't exist. However, localized measurements taken in 1994, 2002, and 2007 allowed Kipp to conclude that radium-228 has risen sharply over the 2007-2015 period, and most of this increase must come from sediments at the continental margin. The permafrost that was previously preventing the incorporation of sedimentary radium into the ocean contains something far more dangerous than tiny quantities of the radioactive element – methane, which would greatly amplify warming. As climatologist Professor Jason Box famously tweeted: “If even a small fraction of Arctic sea floor carbon is released into the atmosphere, we're fucked”. However, there has been plenty of back and forth in subsequent research on just how much methane release we are actually experiencing, let alone how much to expect. Although we don't yet have enough information to calculate the rate of release of methane or organic carbon from permafrost melting based on radium measurements, Kipp and her colleagues' work provides a baseline for future research. In the meantime, the evidence is sufficient to make them confident nutrients are increasing in the Arctic along with the radium. In combination with the greater sunlight reaching the sea surface as ice melts, this could greatly increase biological productivity, transforming the Arctic ecosystem.